Order within 31 hours and 15 minutes to receive your order by Tuesday 23rd April. 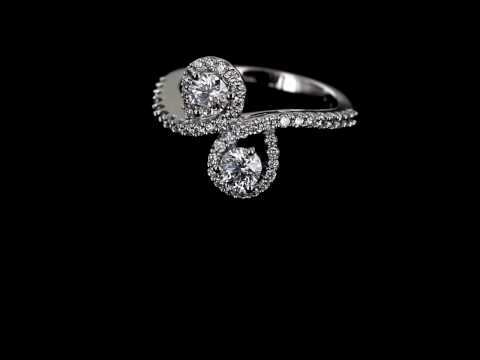 Indulge in the elegant and rare beauty of this diamond cluster twist ring, a completely unique and show stopping piece. This diamond cluster twist ring has been gorgeously crafted out of 18 carat white gold which has created both the shank and the settings of the ring. The plain shank has been finished with a full 18 carat gold hallmark and fits seamlessly around the finger to the bloom into the diamond set shoulders. Each of the shoulders have been decorated with individually set brilliant cut diamonds which slightly graduate towards the central setting creating lower pierce decoration. The shoulders from here then twist together and loop into a pear shape, and each shape enclosing a larger single brilliant cut diamond. The diamonds have a G colour which allows them to perfectly pair with the shine of the white gold. This ring is available in a range of sizes, please state the size you require when ordering. If you should have any further questions regarding this diamond cluster twist ring then please do not hesitate to contact us.